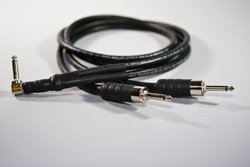 This Speaker Y Cable will plug into back of amp using a high quality right angle G&H plug specially designed with a large back opening for heavy gage speaker cable and splits the signal into two Large body Male plugs. Made for speaker applications with 14 gauge high quality high strand copper speaker cable. Standard Power Y III comes standard with 2ft Male legs. Optional lenghts available.